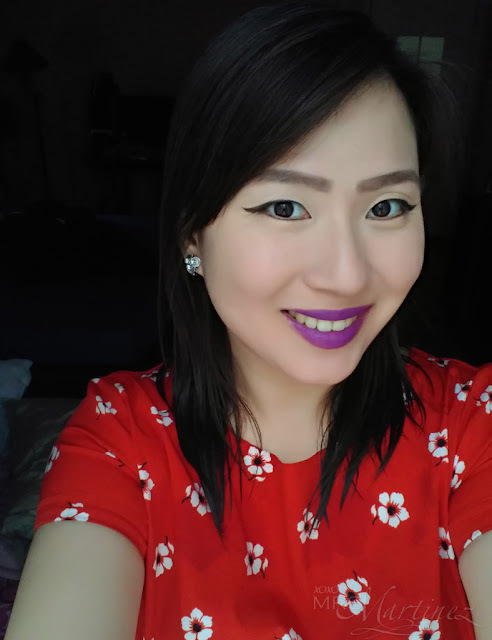 I was in Cebu when Watsons announced its Valentine's Special---> get Php 100 off on all Maybelline Color Sensational Creamy Mattes lipsticks. Unfortunately for me, the product was still not available in Watsons SM Seaside City Cebu at that time. I did the next best thing---> I asked my sister to buy the shade Vibrant Violet in Watsons Greenhills Shopping Center. I could not wait to give it a try! The day after my arrival, I immediately applied it on my lips. Surprisingly, it glides on smoothly, no tugging feeling which is often the result of a matte finish. I don't even have to swipe my lips with a balm prior to application! I have to share a close up photo of my eyebrows. I love that the shape of my eyebrows cooperated with me on the day I took this photo. Plus, I can't wait to tell you more about my recent discovery---> a new product from Etude House that can help you have an almost perfect eyebrow makeup like mine. Please do check out my succeeding entries! 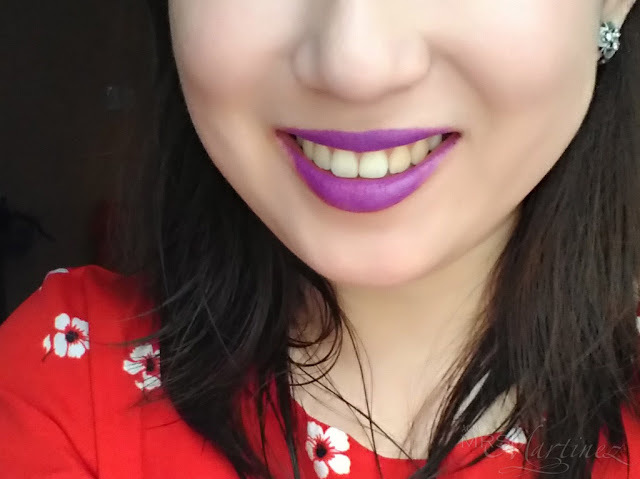 After sharing what I like about Maybelline Color Sensational Creamy Mattes in Vibrant Violet (681), what is there not to like? 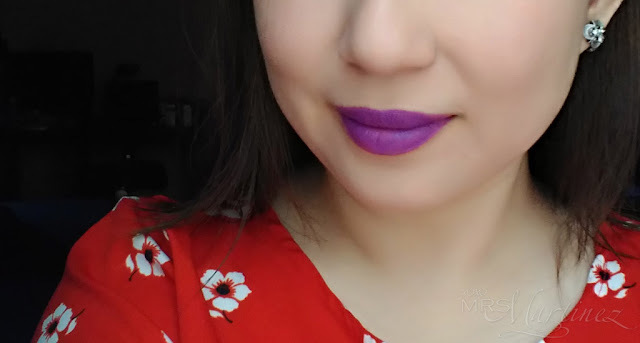 If you want to make a bold lip statement, I suggest that you check out the other 10 shades available that can create stunning results especially the shade I got! 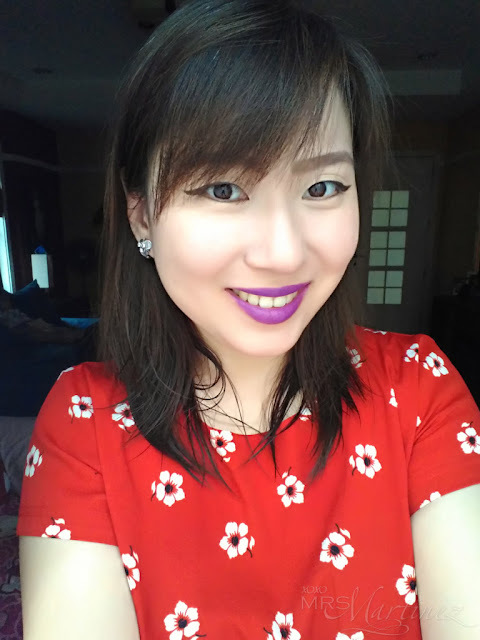 I could not get enough of Maybelline Color Sensational Creamy Mattes, I bought two more shades from the same line- Ravishing Rose (670) and Touch Of Spice (660). This time, it was not on sale though, I bought it at a regular price of Php 299 each. More #FOTD soon! Do you own a Maybelline Color Sensational Creamy Mattes? If yes, what shade? How do you find it? Yay or Nay?